The Truths We Hold by Kamala Harris, Penguin Press, $40. While she admits to human frailties such as consuming an entire bag of Doritos while watching Hillary Clinton lose her bid for president, the rest of the narrative is more along the lines of I-Kamala-Harris-Superwoman. The idea might well be to save the world from you-know-who, but to sing one’s own praise appears a tad, well, forward. One cannot succeed in politics if one is not out there, but it’s hard not to think, wouldn’t it have come better from someone else saying what a hero she is? Well, they have. Kamala Harris is a very highly regarded public safety and civil rights leader. The senator from California – the second Black woman ever elected to the US senate – has served as district attorney of San Francisco and California’s attorney general. She has prosecuted transnational gangs, big banks, big oil. Harris shares her journey from being one of “Shyamala’s girls” – her mother raised them as a single mom after separating from her father when Kamala was very young – and the lessons early in life from being taken to civil rights marches and from family discussions. My mother would laugh telling a story she loved about the time when I was fussing as a toddler. “What do you want?” she asked, trying to soothe me. “Fweedom!” I yelled back. Her years in Canada in middle school while her mother conducted research at the Jewish General Hospital and taught at McGill are covered in barely a page or two. There are lots of family photographs and some family history. But one doesn’t really get to know the woman behind the story. The Reckoning by John Grisham, Doubleday, $37. A much-respected war hero walks into a church and shoots a much-loved minister dead. The town is thrown into a turmoil. What is behind the cold-blooded killing? The confusion is compounded by the fact that Pete Banning is not talking. Not to his lawyers, not to his only sister, not even to his two children. Will he take his secrets to the grave? Grisham provides a ringside view of the justice system in the American south of the 1940s. Some rules were written, others simply assumed. For serious crimes, the juries always comprised twelve white men. He takes his readers on a walk through the horrors of the jungles of the Philippines during World War II. The Reckoning is John Grisham at his best. The Little French Bistro by Nina George, Broadway Books, $22. From the author of the delightful The Little Paris Bookshop, another lovely book about self-discovery – specially for people who are sometimes regarded as past their best-by date. After forty-one years in an unhappy marriage, Marianne doesn’t want to continue to live like the people she meets at the hospice she volunteers at. On their deathbeds, all had confessed this to Marianne: the things they hadn’t done, the things they hadn’t dared to do. She decides to end it all, but fate intervenes and she finds herself in a little seaside town with an unforgettable cast of colourful locals. On this coast, known as “end of the world” she makes a fresh, new start. It is this Brittany George sets the book in, and describes in loving detail. Selected recipes from the region are an added bonus! Devil’s Advocate by Karan Thapar Harper Collins India, INR 699 Karan Thapar, a familiar face on Indian television to viewers of a certain vintage, has made a brave attempt to put down his life’s memories in a book form. In the course of his long journalistic career Thapar has had easy access to some of the prominent newsmakers of the day including Aung San Suu Kyi, Rajiv Gandhi, Benazir Bhutto, LK Advani, Amitabh Bachchan, Kapil Dev, Pranab Mukherjee, Narendra Modi and others. However, the author manages to eke out barely two-dimensional portraits of some the momentous events in the subcontinent’s sociopolitical past and fails to deliver on the promise. 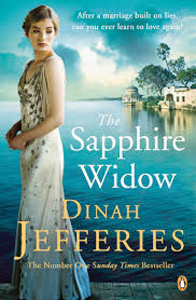 The Sapphire Widow by Dinah Jeffries, Penguin, $16.99. Ceylon, 1935. Louisa Reeve, the daughter of a British gems trader and her husband Elliot, a charming, thrill-seeking businessman have a seemingly perfect life. But as Louisa struggles with miscarriages, Elliot is increasingly absent. After his sudden death, she is left to solve the mystery with the help of Leo. A classic romance with the damsel in distress and the rugged hero to the rescue. Fans of Dinah Jeffries Before the Rains will find it an enjoyable read. My Friend Fear by Meera Lee Patel, Tarcher Perigee, $24. Could our deepest fears be shining guideposts, lighting the way to what we truly want in life? What if we listened to our fears instead of pushing them aside, allowing them to lead us into the unknown? This is a book about how we hide from ourselves, reluctant to look inside, frightened by what we may find, writes Meera Lee Patel. The fear of being different forces me to be like everyone else. Hitting the Books by Jenn McKinlay, Berkley, $34. One expects a murder mystery with a library director as the chief sleuth to be solved through clues from books. But though library members feature in the tale, there is a passing reference to Wuthering Heights, and the group reads A Tree Grows in Brooklyn, it’s not like they find clues in books. And the Jane Eyre-ish story angle is not really explored. Not exactly in the OMC category (One More Chapter syndrome, as explained in the book!) but a fun read. Dino by Diego Vaisberg, Templar Books, $21.99. What does a family do when a gigantic egg appears in their backyard? Wait for it to hatch. And what does it do when a dinosaur emerges? Adopt it, of course! Adrienne Whitaker’s Teen Review of Twelve Steps To Normal by Farrah Penn Little, Brown and Company, $21.01. Twelve Steps To Normal by Farrah Penn is a heartwarming story about sixteen year old Kira and how her Dad’s addiction to alcohol tore her life apart, forcing her to move to Portland with her aunt. Now Kira is back in Cedarville and is desperate for her life to go back to ‘normal’. I recommend this book to anyone who enjoys family-oriented stories. It is also heartwarming and romantic too! On top of being a feel-good story, Twelve Steps To Normal deals with issues that are experienced in the real world. Although the book can be slow at some points, it accurately portrays growing up and living with a parent struggling not only with addiction but with grief as well. On top of that we also see the situation from Kira’s perspective and how dealing with her father affected her psychologically. Overall, I would rate this book as an average read. Although the book deals with relevant issues the writing style is a bit lumpy and slow at times. • Adrienne Whitaker is a grade 10 student and a member of Brampton Library’s Teen Library Council.